Having meat (chicken or beef) was more of a treat as I didn't eat it every day. Friday's Korean BBQ Steak bowl was my first beef in a week so it was fantastic! This was a pretty fantastic dish. I wish I had the right kind of mushrooms (baby bella) as they would have been able to hold their own much better than the button ones. I also wanted to add more Parmesan cheese to it but held out, which turned out OK as once incorporated you could really taste it. Easy to make (thanks to Tesco having pre-made spiralised spaghetti squash) and trust me, you don't miss the meat at all! 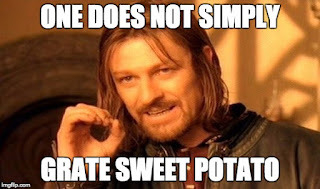 Even after the Great Sweet Potato Debacle where I thought "I don't have a spiraliser, but don't worry grating should be fine" turned out to be disastrous in the kitchen, I found the sweet potato dish to be very delicious. I added some raisins into it as well, and thought it was a great addition to the dish, providing little bursts of sweetness. I don't think I made enough sauce, but that was my own fault as I did not know how much grated sweet potato I would have (and I had a ton leftover). Never one to just throw out food, I made some pancakes (utterly fantastic with maple syrup) and a smoothie (would not make again, no flavour) with the extra. Dinner was pretty delicious, and I remember thinking how sad I was I did not have leftovers. Just be careful as the zucchini (courgette) gets very watery and I had a wonderful accident with most of the liquid on my work trousers. YAY MONDAY. I also could eat roasted peanuts every day. So. Fantastic. This dish probably had the most "ugh will I ever use this again ingredients associated with it". But if you enjoy Thai/Indian cooking you should have no issues here! I do not have a photo of the breakfast burrito but let me tell you it was quite fantastic. Just enough cheese to pass muster (you can always add more) and the egg whites help to bulk it up without add too much fat. I almost wanted to add olives to it, but had none on hand. I still have a burrito wrapped in the freezer for next week! Again the courgettes get very watery when you cook them (this should not be surprising to me, buy hey ho) so either quickly flash cook them or take it into account when cooking with them. I would almost have left 'raw' and let the chicken 'cook' them on the plate. The chicken cooked up beautifully and the breadcrumbs did not fall off, and the mixture of panko and normal with some Parmesan cheese worked beautifully. Could have really gone nuts with the mozzarella but maintained discipline. This dish does NOT make good leftovers! I had Pokē for lunch (raw fish salad) and curry with coworkers at a restaurant in the City for dinner. Tried to be good and only had naan rather than naan + rice. Had pancakes for breakfast- was a good day. I am trying to make it a habit of running with the Advent Running crew who do a Beigel Run every Friday morning. This requires me waking up about 2 hours earlier than I normally would to get up to Brick Lane, run about a 10k, and then get back to the office for a shower around 0830. However, the reward is a sweet sweet Beigel from Beigel Bake on Brick Lane. AND the smug satisfaction of having a great run in before people even are getting into the office. WIN. I bulked up the steak bowl with some spiralised carrots and this really took the dish to a whole new level. It was fabulous. Good amount of heat and was incredibly filling, yet still left you wanting more. Hence why I had it for dinner as well. I was pleasantly surprised that the amount of beef I used was so satisfying. I cut most pieces down to smaller portions, so I had some tasty beef with almost every bite. Much better than having only a few larger pieces and then being left with nothing. I felt like Sunday was just full of prep for the entire week, it was very tiring. I couldn't make everything as I was running out of tupperware and fridge space so I needed to make some lunches during the week as well. However it was mostly over with by Tuesday so Wednesday onward was smooth sailing. I doff my cap to people who can plan meals for the entire week in advance, it took a lot of effort. I may try and do a starchless dinner 3x a week and meatless days 2x a week. Its doable but it requires more planning than I normally put into food prep. Challenges are fun but its also good to be spontaneous too! I can already say I have eat more carbs this weekend than I have all week. I don't think that is good. So there is still some work to do. Just because its the weekend does not mean I should go all out-- couple of treat here and there but no need to ruin the hard work of the last few days. Of course the pizza I ordered today at NY Fold after my race was 100% me. I have no regrets. So today I can unveil my ambitious meal plan for this week. You can see it all in Google Doc glory and also grab the recipes. Today was crazy prep day. I started around 1600 and finally closed the kitchen at about 2100, taking an hour out to eat dinner... OK and maybe a few more to follow UKRunChat Hour. Dinner consisted of butternut squash "pasta" with mushrooms and parmesan. Pretty simple to whip up and even with the recipe halved it still resulted in a lovely amount of parmesan to mix in. I tried to be as precise as possible in an effort to keep portion control in check (hooray electronic scales!) and am satisfied with the results. Wish I had the right kind of mushrooms as I lost some of the meatiness that would come from baby bellas. Still-- quite pleased with the taste! I am looking forward to lunch tomorrow with a bit of trepidation as well... the sweet potato is supposed to be spiralised. However, I do not yet own a spiraliser-- so I figured one could simply grate and get similar results.... the answer is a resounding NO. The final product is more shaved sweet potato, and the issue of course being no uniformity. The garlic dressing tasted pretty good and whilst mixing in with the spinach and potato I also decided to add sultanas, figuring they will add a hit of sweetness. Too much sweetness though? Will find out tomorrow! Another side affect of the 'Great Sweet Potato Debacle of 2016' is now I have a TON of leftover shaved sweet potato. I am sure I will figure out something to do with them, but currently they are sitting in a bowl of water covered up. I am almost thinking like sweet potato crisps in the oven?? I also have my workout schedule all figured out as well--Look at me so on the organised! I am also wondering if this diet will affect my running/workouts. I figure as long as I am still getting the calories I need (albeit what I imagine to be healthier ones than normal!) I should be pretty OK. Here is hoping I do not fall off the wagon, or if I do, I can gracefully pull myself up again. A common thing people never seem to have time for (or say they never do) is volunteering. Living in London, it can be sometimes hard to volunteer through your job as it costs money, with the premise of it being used as a corporate outreach. Fair enough. Or it may just be too darn popular (city farms anyone?). Also, a lot of places want you to commit to x number of weeks to show up, which is hard for people with a variable work schedule. So you end up not volunteering at all, more dejected than hopeful. Then in comes GoodGym- a brilliant idea that was born out of frustration with gyms. It all started back in 2008 with one borough, but now its has blossomed to over 12 and even has groups in Bath and Bristol. We run in groups to do manual labour for community organisations. We run to make social visits to isolated older people who we call our 'coaches' because they motivated us to keep going. We run missions for vulnerable people; clearing gardens, changing lightbulbs and doing odd-jobs for people who struggle to do them alone. We are supported by some of the best personal trainers and running coaches in the UK. They come on our group sessions and help us keep our fitness and technique on track. I went along to their inaugural Southwark GoodGym event on Wednesday. Everyone was very friendly and there were many 'newbies' so striking up a conversation was easy. Jo, who is also a personal trainer, got us warmed up and we set off on a very leisurely run to the Wilderness Center. When I say leisurely, I mean between 10-11 minute miles. Bringing up the rear was Adele, who made sure no one got left behind or lost. It was fun to spend a couple of minutes just chatting away only to realise you were at your destination! I never knew Galleywall Nature Reserve existed until then, which to be honest I am a bit ashamed about as it is not too far from where I live. It looks like a great places to bring the young ones, with plenty of snails, bug huts, and green space to have a quick dash about. We got split into groups and I was put into compost detail. There was four of us so we ended up taking turns of turning compost and removing twigs. Apparently sticks are the bane of the compost world-- who knew? After about 30 minutes or so it was time to head back. Jo had us skip to the next street corner to get us thoroughly warmed up again, then offered a 'challenge' to have people sprint to Old Kent Road and back. I did not hear the and back bit and only realised as I was huffing away and saw people coming back... Oops! Still, managed to get the heart rate moving. Verdict: I would not call GoodGym an intense workout- nor do I think it is meant to be. It's meant to get you outside and into your community while sneaking in some exercise. It's also meant to be fun- one thing many people do not describe running as (myself not included). I will say that it makes a great recovery day. Light on pace while adding a bit of strength. Sign me up! I did mange a 10k run on Friday afternoon and boy was it lovely! Although it was chilly the sun was out in full force so it felt amazing. At that point I realised how happy I was that I didn't force myself out of bed for a morning run, else I would have missed out. I find it very hard to run in London and NOT stop and snap a few photos, especially when I can potentially get an angle that is different from the countless thousands taken every day along the Thames Path. With the tide being low, I was able to go to the 'shore' and find some more unique shots. It also helped that it was so sunny I was not too keen to get back to the office! I am happy to report I have tried some pretty tasty smoothies and starch-less lunches this past week! Caramel Apple Smoothie (via PopSugar): This was our dessert one night after dinner. It was very easy to whip up and I found all the ingredients at my local Tesco Metro. had to swap out almond milk for coconut milk due to nut allergies in the Moose house. Still tastes delicious. Clever idea using the dates to simulate the caramel flavour. Husband approved as well so another big bonus there. Made two large glasses + a little left over I brought into the office next day as a snack. 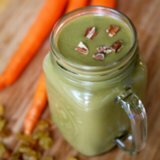 Carrot Cake Smoothie (via PopSugar): Not a vegan but of course a delicious recipe for those that are. I was able to buy a small package of protein powder at a Holland & Barrett, which is good because protein powder is expensive and I am not sure if I need 2 tons of it. Again I used coconut milk which I think detracted a bit from the desired flavour, but all in all it still tasted pretty delicious. This was a breakfast substitute. Made one serving as stated. I have a bit of powder leftover so I have been adding bits to my porridge in the morning. This one also made me realise if I wanted to really get involved making more smoothies I would have to invest in a proper blender. The stick blender was doing a wonderful job, but is was still leaving 'chunks' so it made the smoothie experience more of a bumpy experience. Live and learn! Ribboned Carrot Salad (via PopSugar): This was our lunch for two days (so four servings) and boy was it fantastic. I still do not have a spiraliser but Tesco is hip to the trend (and eager to capitalise) so they have pre-spiralised carrots and courgettes available for purchase. I also bulked out the salad by adding broccoli and chicken, but you could substitute pretty much anything that you would normally put in a stir-fry (sugar snap peas, tofu, baby corn). As all the spiralising was done for me, the hardest bit was cooking the chicken and shredding it into the salad. Very filling and satisfying for lunch. I recommend letting your portion sit out for about 5-10 minutes prior to eating as sometimes cold cooked chicken can have a weird texture right out of the fridge. I was getting some curious co-workers ambling over to see what I had, that NEVER happens with a sandwich! Nusa Kitchen: This place has some amazing soups (there salads look fantastic as well) and the best thing is you can choose to have it with rice or without. It can also come with a nice dollop of yogurt or a healthy sprinkling of coriander. If you do not want rice, you can opt for a free piece of fruit instead. Their menu is changing weekly but if you see vietnamese chicken with sweet potato soup- get it. You will not be disappointed. Don't be scared of the queue which seems to never end, it goes quick! Yes its that time of the year again. A whole new year full of hopeful wishes that are generally dashed or forgotten by June. I am hoping this year I can set more reasonable goals, as most of my 'big' goals are already signed up for. So I am hoping to make smaller changes which hopefully become natural over time. Prudential RideLondon: Not sure why I thought a bike ride would be a good idea, considering I have not gone on a bike ride really since 2013. But here we are. Training starts in May. A marathon: Still not sure which one yet, but it will be in the Fall, after the big bike ride. And now, my bigger challenges, the smaller ones! Up veggies: I almost put down 'cut back on meat' but I thought better of it. This actually pairs well with the first one as now we have the crazy spiralised vegetable fad which substitutes pasta/rice for veg. Swap processed snacks for healthy, natural ones: Sitting in an office means the temptation for snacking is high. If I am going to do so, I will try and ensure its something more natural than Oreos. I will not give them up entirely, as typically doing so results in a break down of disastrous proportions. Also, I am not crazy. Try to join (and stick) with a running club: I do not know why I have such a hard time getting myself to these. There are quite a few very close to my office and home. I still really like running on my own terms, but I think these would really come in handy for interval/hill repeats. Like most things, it's going enough to where it become habit. So the blog this year will focus on these goals. Eating better, training better, and just feeling better! It would be very strange waking up in darkness. I knew this would be the case. However, it was even more strange running a half marathon in the dark-- at 3pm. It was -8° C and I was jogging in place at the starting line. I was eager to get moving, every minute felt like it was getting colder. I looked down at my trusty running shoes, looking a bit more like a Transformer with its new running ice spikes purchased that day. No, the Tromsø Polar Night Half Marathon is not your normal half marathon. And I definitely wanted it that way. This is not your typical half, it not difficult in terms of terrain but weather wise it is definitely one for the books! Entering the race was very easy, and there were no issues at all. Got my race number via email a week or so before the race and given further instructions on where to pick up my bib. Tromsø itself is quite small and everyone is very friendly so finding your way is no issue! I arrived late Friday night so could not attend the pasta party, however we had our own carb-load at Casa Inferno. Definitely use the daylight hour or so before the race to snap some photos of the harbour! I am not joking, its about an hour of daylight with about and hour of dusk/dawn light. The race itself was a there and back route from the center of Tromsø to the airport. They had candles lit all along the route, but to be honest it was well marshalled so there really was no point where I was nervous about getting lost. On the loop back the wind started to pick up, which along the water was very chilling. It was at that point that I wished I wore wool gloves instead of my fancy synthetic ones! I had no dreams of a PB on the race, I was simply wanting to keep below a 2-hour time. I was using other runners for pace, including one of them a Northern Runner. I figure if anyone was used to this kind of temperature running, it would be one of them! Upon finishing, I got my medal, space blanket (yay!) and half banana and shuffled quickly to change. Sadly I cannot talk about the award ceremony and party as we needed to leave Tromsø shortly there after to get to our cabin. If you decide to register for this race and if you can, test out running with spikes in case you need to on the day. My first run with spikes was the race, I am sure I lost some time trying to get used to the feel of them. My right arch was sore but it went away overnight.